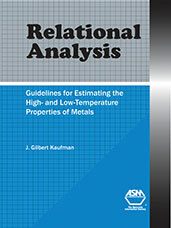 Relational analysis, defined as quantitative analysis of the relationships of high- and low-temperature properties in relation to their room-temperature values, provides a useful technique for estimating the properties of similar metals and alloys for which limited or no data are available. This book demonstrates how to use relational analysis methodology to extrapolate and estimate properties of metallic alloys at high temperatures from lower temperature data, and for estimating the properties of alloys for which scant property data exists. Data tables and graphs are presented for a wide range of aluminum alloys. Also shown, is how to apply relational analysis to other alloy systems including steels, magnesium alloys, and titanium alloys. If you do not have access to SAE MOBILUS via username/password or institutional access, you can still purchase the Book, Relational Analysis, Guidelines for Estimating the High- and Low-Temperature Properties of Metals.